For city-dwellers far removed from the realities of agriculture and food production, farming tends to be portrayed in one of two ways: either as something whimsical and bucolic, like the cover of an Enid Blyton book, or as a tough, unforgiving and brutal scene ripped straight from Ken Burns’ The Dust Bowl. Regardless of which way non-farmers view farming, there tends to be a common thread throughout: that life on the land is one defined by a lack of technology, grueling manual labour, and rigorous adherence to traditional practices. Of course, anyone who’s set foot on a farm in recent memory knows that’s not true. In fact, Australian farmers are an incredibly tech-savvy and adaptable bunch, constantly looking for new technologies and methods that will help ensure they can continue to produce high-quality food in a challenging climate. Despite what stock images would like you to believe, you’re far more likely to see a farmer holding an iPad than a rustic wicker basket full of beets. Protected cropping is currently the fastest-growing food producing sector in Australia, with 29% of Australian vegetable farmers already operating in protected cropping, and an industry expansion rate of 4-6% per annum. If those rates were to hold steady over the next 10 years, we could see as many as half of Australian vegetable growers operating in this sector. Protected cropping helps mitigate some of the risks associated with Australia’s unforgiving climate, making it possible for growers to get higher-yielding, consistent crops. While protected cropping requires more expensive infrastructure from the outset, the demand is certainly strong enough (Woolworths have doubled consumption of greenhouse capsicums every year since 2005) to justify that additional expense for a lot of growers, especially as climate risks increase. The Netherlands, home to 17.3 million people over a total area of just 41,500 square kilometres, is one of the most densely populated countries in the world. And yet, it is the world’s second-largest exporter of food and agriculture products, second only the United States. So how has this tiny nation – more famous for bicycles and legalisation of cannabis – become such a major player in global agriculture? The Netherlands has adopted innovative agriculture technologies and practices with gusto in order to make the most of their limited land mass, resulting in high yield with minimal resource use – something all producers are striving for in a time of unprecedented demand and resource scarcity. The Duijvestijn family farm outside of Delft is an example of what we can expect to see in horticulture in the next 10 years. The four brothers who run the 36-acre greenhouse complex have constructed a self-contained, resource independent farm, which produces almost all of its own energy and fertiliser, as well as some of the packaging required for sale and distribution. The temperature in the greenhouses is maintained by geothermal aquifers, and the fiber-rooted plants require less than a quarter of the water of required by plants in open fields. It is impossible to discuss the challenges of agriculture in Australia without first acknowledging the intense variability of the Australian climate. From the harsh desert of Alice Springs, to the monsoon conditions of the far-north, to the oceanic climate of Tasmania and Victoria, there is no single ‘Australian weather’. That level of variability has always presented challenges to growers, and that’s unlikely to improve in the next 10 years. As a result, there has been a growing push to adopt traditional Indigenous land management practices, which may help us work better within such a complex climate. Indigenous historian Bruce Pascoe is eager to see growers move to crops native to Australia, which are nutritionally dense, as well as better suited to the climate and topography of the country. And Landcare Australia, a not-for-profit organisation that has been dedicated to improving land management and sustainability for 30 years, has recognised the sophistication of Indigenous agricultural practices and is now actively working with Indigenous groups to bring those practices into common use. 2018 was the year that meat alternatives really went mainstream. Woolworths started selling 100% plant-based mince. Hungry Jacks launched a vegan burger at some of their stores. Beyond Meat and Impossible Foods, two US based meat substitute companies, saw huge growth, and both are expected to go public in 2019. The unfortunate reality is that the way we eat currently is unlikely to remain viable as our population continues to grow, and our natural resources become more strained. While it’s unlikely that by 2028 plant-based meat substitutes will replace animal products entirely, we’ll likely see greater demand for more sustainable proteins over the next decade. Technology is helping to make meat alternatives more palatable for a population used to grabbing a beef burger or steak whenever they feel like it, but it’s still a fledgling industry lacking the production and marketing expertise of the meat industry. In ten years, however, it should be a different story. The island nation of Singapore is known for a passionate food culture, the highest number of millionaires per capita, and its militant rules on cleanliness. However, it’s becoming increasingly known as a hub of innovation in the vertical farming space. Singapore produces only a fraction of the food its 5.6 million residents consume, relying on overseas exports for around 90% of its food supply. To tackle that reliance on external markets – and the potential issues that can cause – Singapore is looking to take horticulture upwards. Vertical farming is expected to reach $13 billion market share by 2024, across the hydroponic, aeroponic and aquaponic categories. In areas like Singapore – where real estate is scarce and expensive – vertical farming will allow for more local production of food. At the moment, leafy green and cannabis are the most successful crops grown in vertical farms, which is obviously not going to make much of a difference in terms of food security. However, as the technology evolves over the next decade, we may see more nutritionally and calorically dense foods being grown alongside corporate skyscrapers across the globe. Given the attention given to the future of food security amidst a growing population and climate change, we’re still wasting a tremendous amount of food. Around a quarter of the global food supply (by calories) is lost and wasted annually, and while we tend to place emphasis on the consumption side of things, the losses occur at every stage of the value chain. Particularly in developing regions, up to 40% of food produced is lost before it reaches the market. Recent research indicates that food loss at the manufacture stage is driven by a lack of collaboration in the supply chain; ultimately when farmers, processors, and buyers aren’t in sync, it’s difficult to get supply and demand right. By 2028, we’ll have tackled food loss and waste globally – simply because we have to. 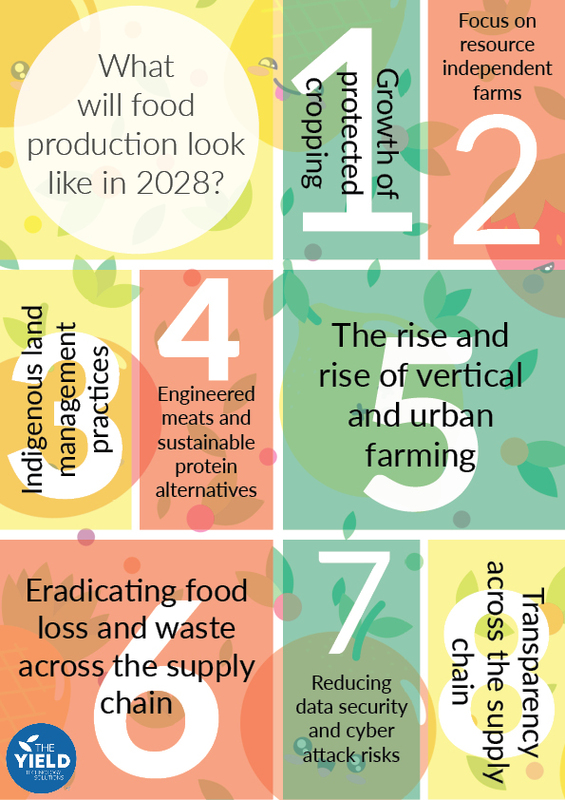 We’ll likely achieve this by employing data analytics to accurately predict supply and demand, finding innovative new ways to utilise surplus food rather than tossing it out, and giving emerging regions access to better technology for storing, processing and transporting food. 2018 was the year in which discussions about data security happened around dining tables, not boardroom tables, as everyday consumers became increasingly aware of the risks of their data ending up in the wrong hands. Over a million Australians chose to opt out of the federal government’s My Health Record initiative (which aims to take medical records online), citing security and privacy concerns. Facebook saw significant user drop-off amid the Cambridge Analytica scandal, and the passport and credit card details of 500 million Marriott hotel guests were stolen in a huge data breach in December. As our world moves increasingly online, the question of how to keep our data safe needs to be a top priority. In food production, the move to automated and digital solutions offers improves efficiencies – but also leaves the industry open to a new host of threats. Major attacks have already been seen in the sector – last year, production was halted at a Cadbury factory in Tasmania after owner Mondelez was infected by ransomware. The attack had a negative impact on company growth and contributed to a 3% drop in the second quarter of 2017. There is no industry more essential than agriculture and food production, and over the next decade, there will need to be a greater focus on keeping the industry secure. Two widespread recalls of romaine lettuce across North America in 2018 highlighted two things: the limitations of the FDA, and the benefits of visibility in the supply chain. When people started dying from e.Coli infections in North America last year, the FDA and CDC issued a country-wide recall of all romaine – not because all romaine was affected, but because it was impossible to say where the affected romaine had originated. Pinpointing the source of the outbreaks (farms in Arizona and California in this case) takes time – days to detect an outbreak, more days to find a common link in what the affected people had eaten, and then weeks to find where that food item had originated. In the food production industry, blockchain could act as a secure way to track food as it moves the supply chain – making it easier to know where exactly our food has come from. There are companies already working on blockchain solutions in the food supply chain - Ecogistix is working directly with farmers to provide the kind of produce traceability that could have reduced the impact of the E.Coli romaine outbreak.